I’ve been using my friend’s car a lot lately. It’s just so convenient: I can avoid the cold, throw pretty much whatever I want inside, and drive to places I wouldn’t normally be able to go. From my experience biking is way better for urban neighbourhoods like Rosemont and the Plateau while driving is better in the suburbs. The population in the city is very dense and homes are very close together. This means there is a lot more trash per block to keep an eye on, a stark contrast from a suburban neighbourhood where you might only have a pile of garbage every 25 yards. The city also has lots parked cars blocking the view of the curb which makes it tough to see what’s there, especially when you take into consideration the increased speed at which you’re moving. That being said driving really is great for suburban neighbourhoods. It’s generally very easy to park, you can cover ground more quickly (important as the population is far less dense), and you can carry a lot more stuff. That’s especially important because suburbanites have a lot more space to store things and seem to throw out a lot more as well. I’m pretty much sick of winter at this point and I’m going to keep on driving regardless of the neighbourhood until it gets a bit warmer. 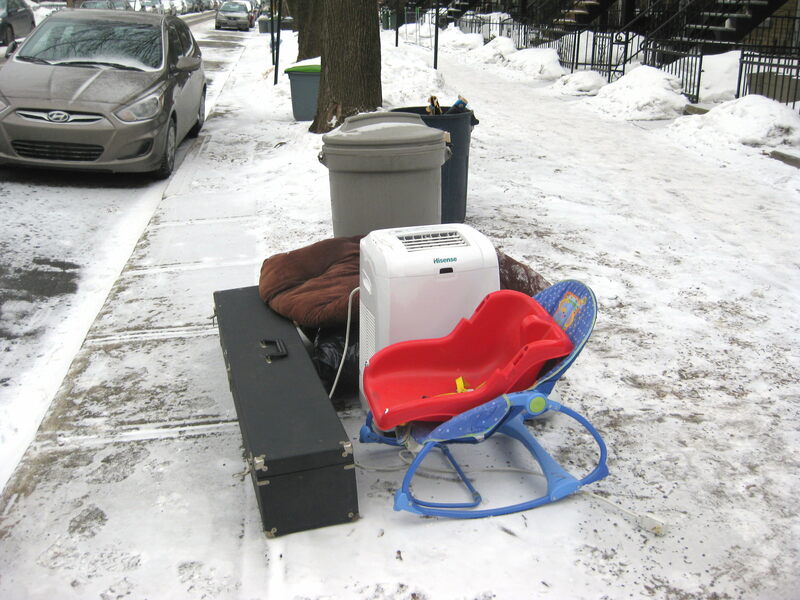 Once spring finally arrives I’ll likely use the car only for suburban neighbourhoods and for travelling to faraway collection days. In the end I also miss the slower, more deliberate and meditative way of the bike and look forward to getting back to my “roots”. Sarah and I went out to the Town of Mount Royal on Wednesday, a neighbourhood perfectly built for travel by car (though fairly bikeable as well). Much of what we found looked to be the victims of moves. This camcorder was inside one of the black bags above. 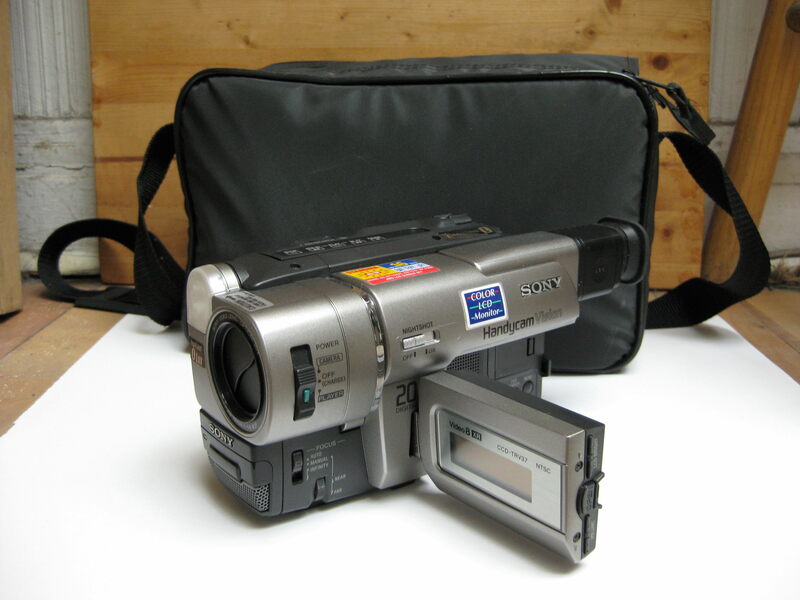 It’s an older model, probably manufactured in the late 90s that runs on Video 8 film. I’d never seen the format before; it basically looks like an audio cassette but for video. With it came the original carrying case and the various accessories needed to run it. I charged the unit and it works pretty well, though the battery (which sells for 15$ on Ebay) barely holds enough life to run even the playback mode. A similar setup on Ebay sold for about 130$ which makes this is a pretty good find! These two nice old tins were also inside black bags. The bottom one, made originally for Wilkins Red Boy Toffee is full of buttons. The top one is full of old matchbooks and other bric-a-brac. 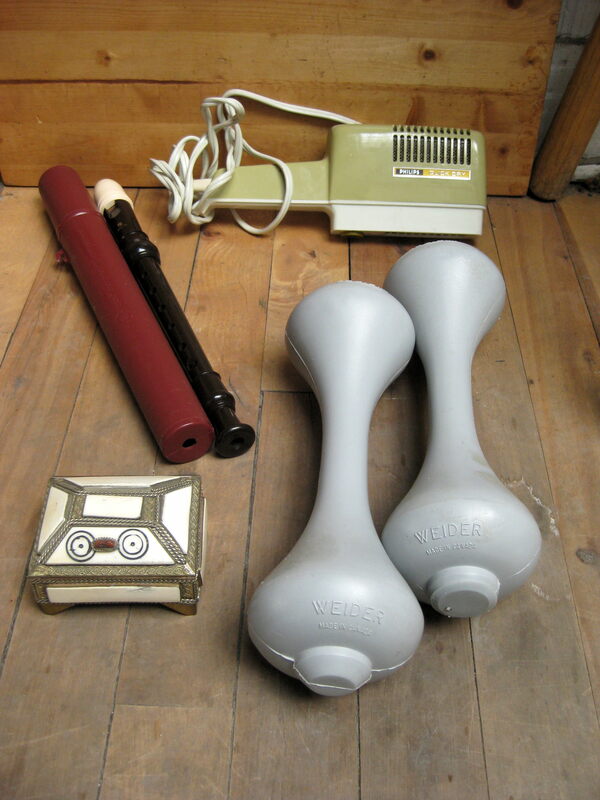 I found a bunch more miscellaneous stuff here as well, including a recorder, old-style weights, a little jewellery box, and various mostly full household cleaners. 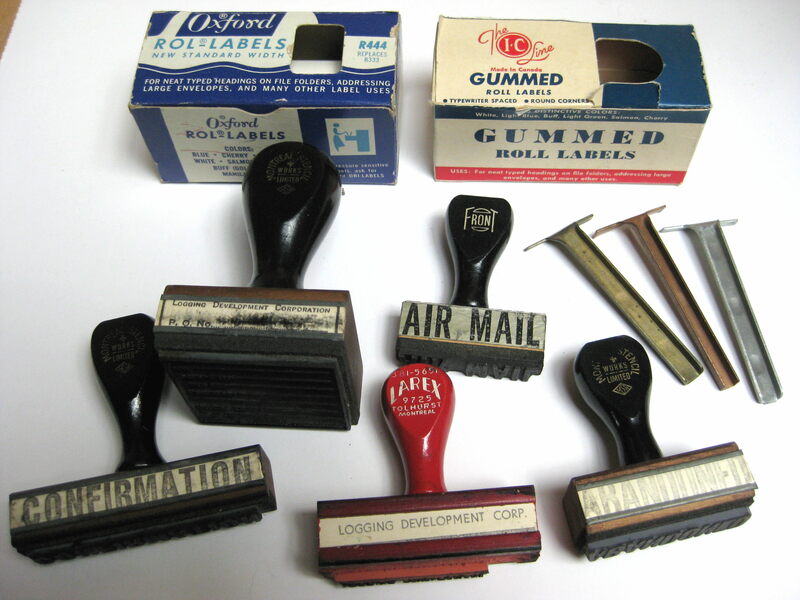 These old stamps were in a bag on the curb in front of a place on Lazard. Two belonged to something called the Logging Development Corporation, the others look like they would have been used for mail. Garbage is generally collected a bit later in Rosemont, my usual Thursday route. This week I decided to head out early and explore a bit of Outremont, CDN, and an area called Glenmount before heading back to Rosemont. Glenmount is basically a tiny piece of TMR that for whatever reason is part of the borough of CDN and has the same trash schedule. No treasure per se, but we did come away with some decent stuff. 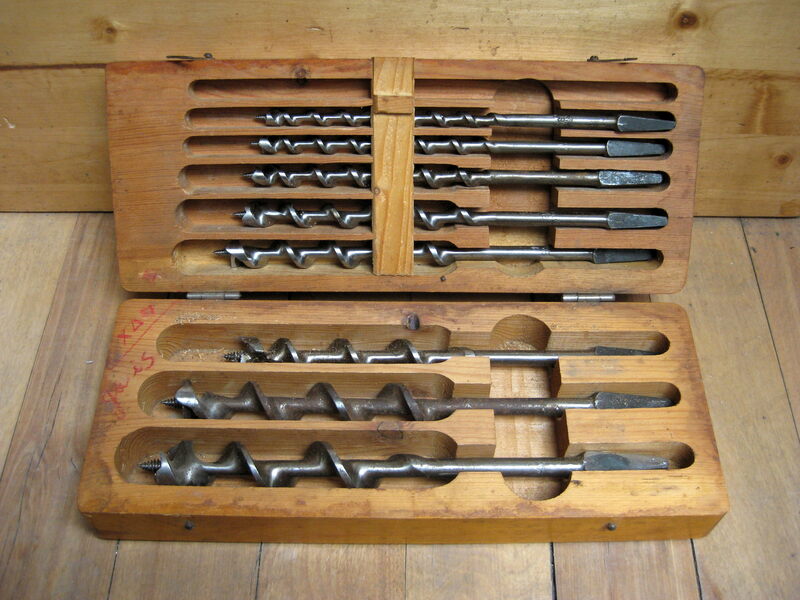 These vintage drill bits, which were made by C I Fall in Sweden and stored in their original box, are actually fairly valuable – someone on Ebay is selling the same set for 165$. I’m missing the smallest one unfortunately but I’d guess that what I have is still worth 100$ or so. There was a lot of toolsy stuff here. The wrench was made by Ford Canada which is kind of interesting. 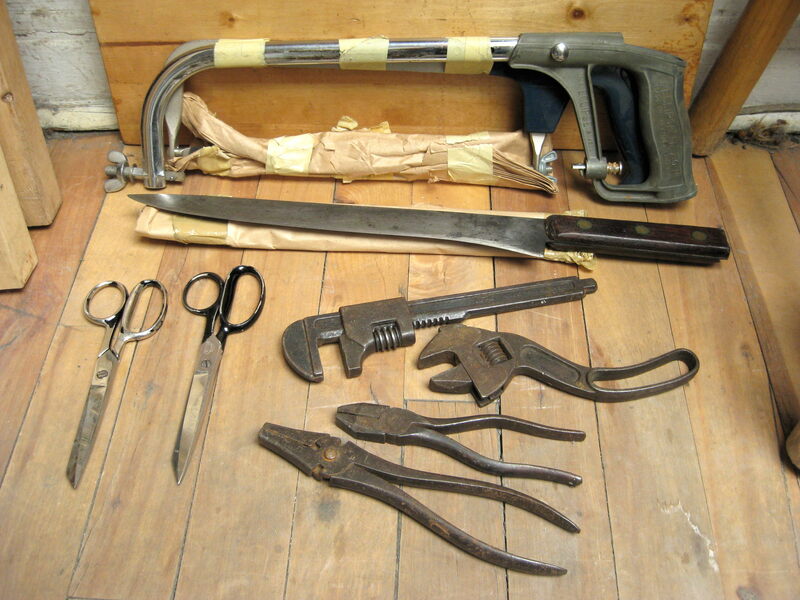 Otherwise, the saws in the back are in fine shape, as are the solid old metal scissors. 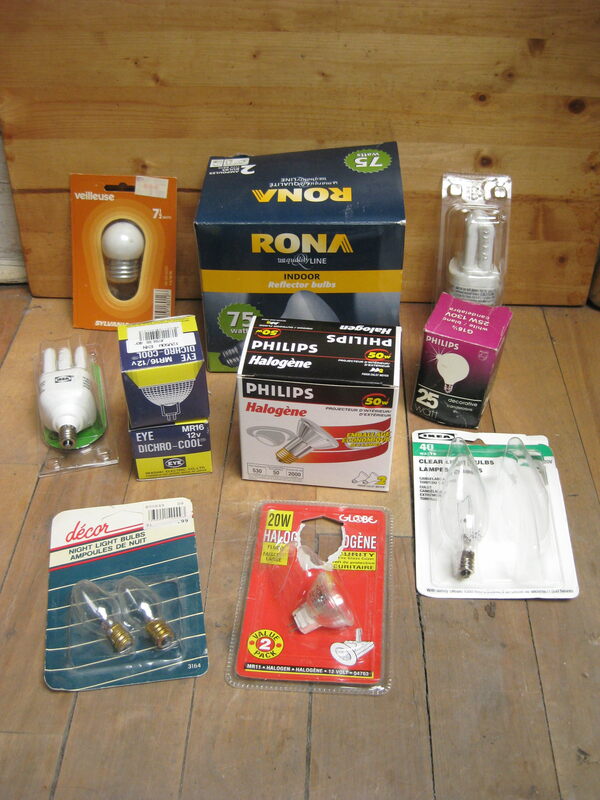 All these light bulbs are perfectly fine and apparently new in the box. 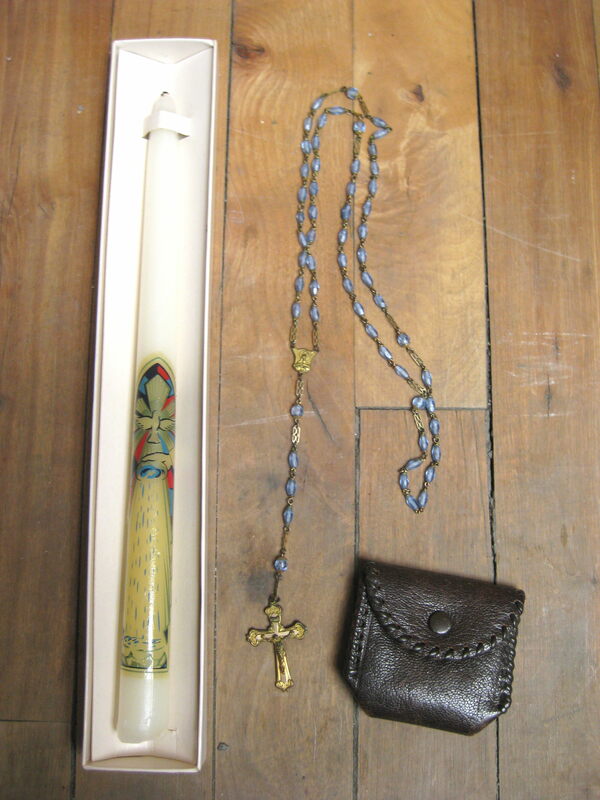 I found a baptism “souvenir” candle and a nice old “Made in Morocco” rosary. There was some decent kitchen stuff as well, including a salad spinner and some funnels. Both were on our “conjuring list,” basically a list of things we hope to find (or conjure up) while hunting for trash so we don’t have to pay for them. For many things, especially kitchen stuff, it’s really just a matter of time until you find a specific item and it’s fun to think you can make it magically appear by writing it down. Also on the list is a lemon zester and a cool lamp. After finished in Glenmount we went back to Rosemont with plenty of trash still to go to. I came across this spot on Garnier that looked to be more moving casualties. 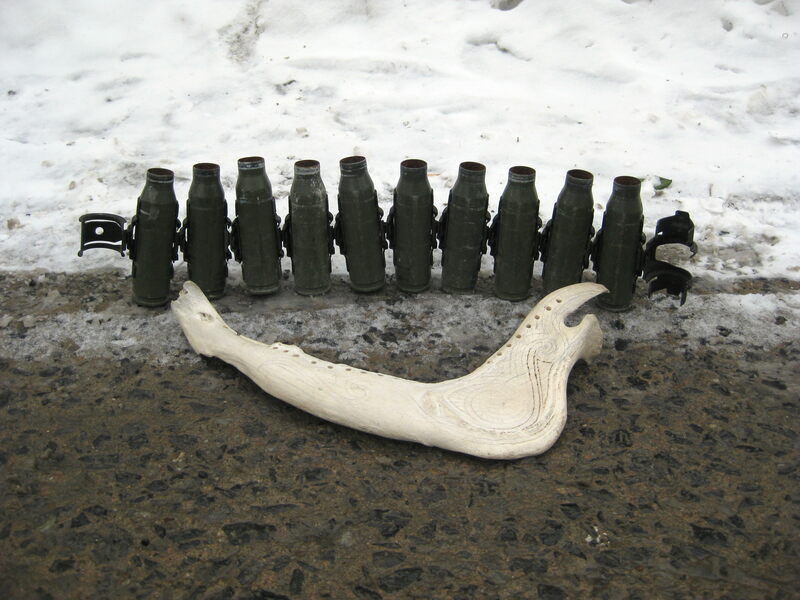 Inside a bag was an odd series of vases made with old ammunition cartridges. I put it in the free box. There was also a big jaw bone with holes drilled in it and some art drawn on the side. I almost put it in the free box as well but I figured it’d be an interesting, if not particularly valuable piece in a yard sale. Also in the bag was this graphics tablet. It’s the kind of thing where you draw on it with a stylus and it goes onto your computer. It’s an older model and seems to work fine, though I have no idea how to set it up. It’s worth around 20$. 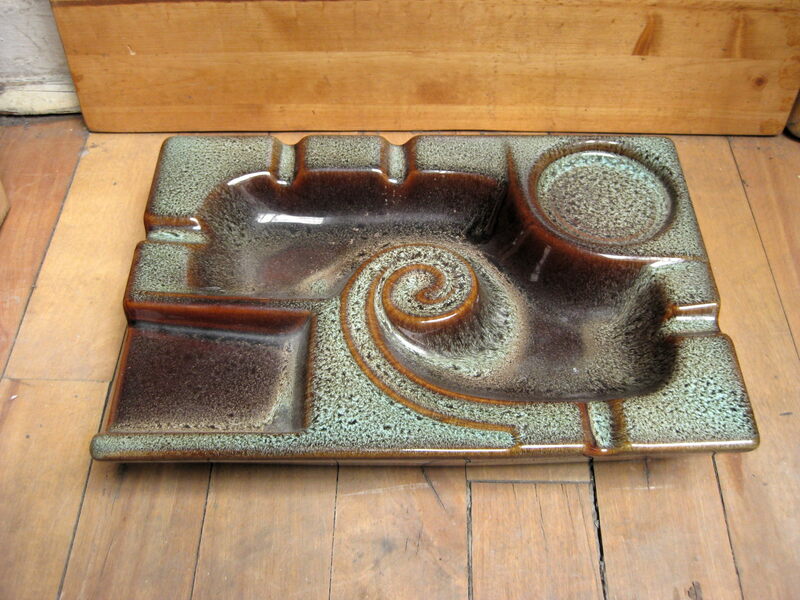 In another spot was this crazy Beauceware ashtray. It’s not particularly collectible but someone will definitely give me a couple of bucks for its kitsch value. 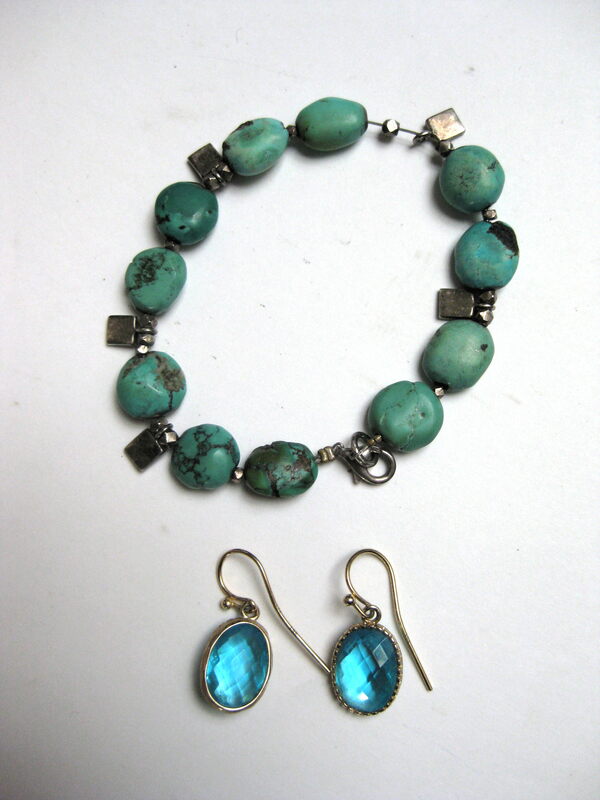 I semi-randomly opened a recycling bin at one point and came across these two pieces of jewellery in a little bag. Both have silver marks. This doesn’t make them exceptional pieces but it does increase their value a bit. The bottom earrings are marked 925 but have a gold tone, could that mean that they are vermeil? The last place we hit up was this spot on Chambord. A woman opened her door at one point and asked me to put the paper stuff I found in the enclosed bins on the left of the picture. Before that I had been putting them in an open recycle box on the right in attempt to save a bit of recycling from being wasted. She was worried about people seeing sensitive papers, though nothing I saw looked particularly interesting. She told me the stuff inside the bags belonged to her mother in law who I assume has passed on. 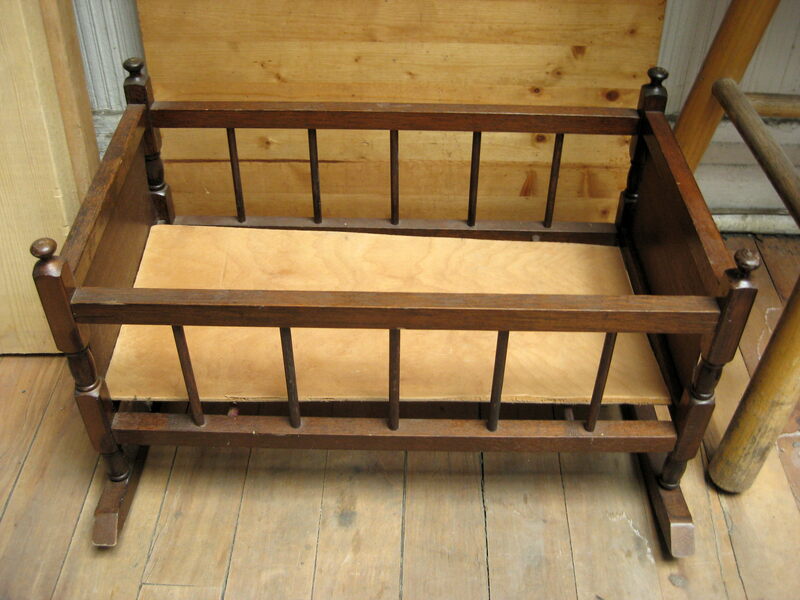 I took this little crib, probably made for a doll. I’m currently using it to hold records. 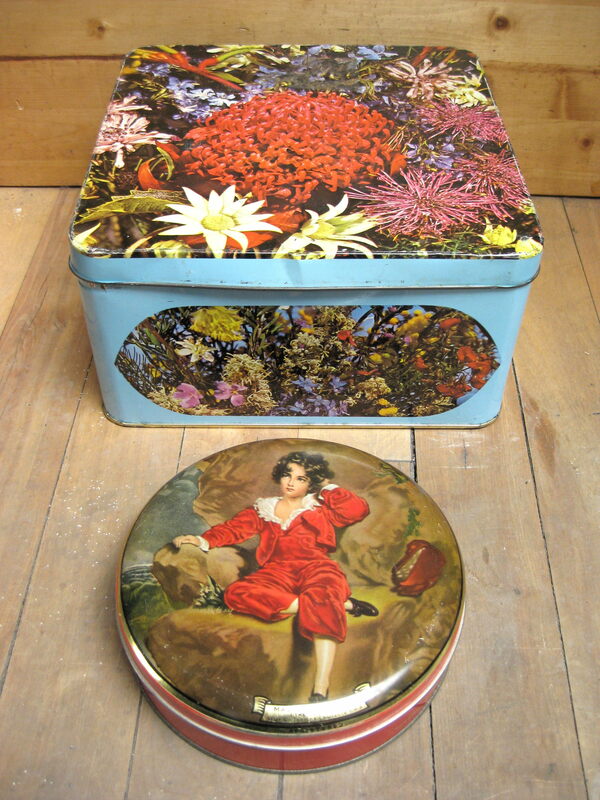 The box on the left is full of beautifully embroidered handkerchiefs. On the right is a fan featuring the image of some Hollywood star of yesteryear. 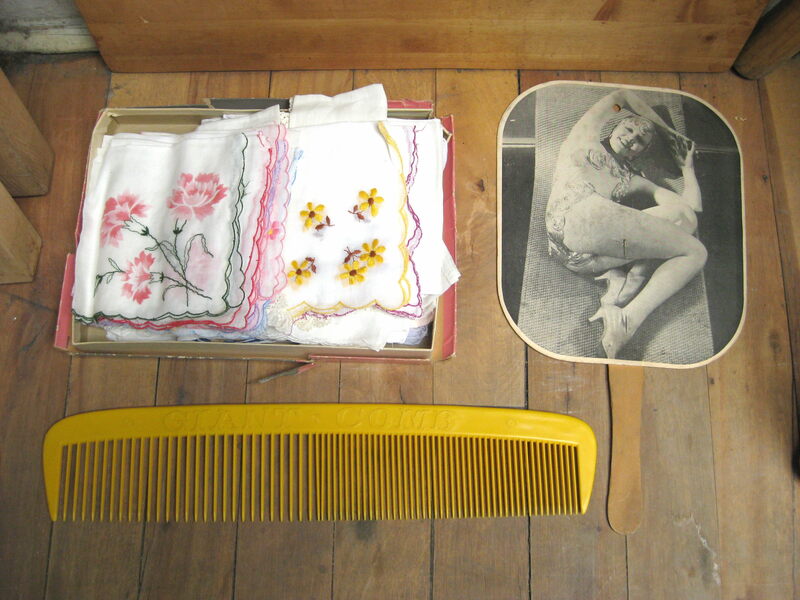 On the bottom is a hilariously large novelty comb. 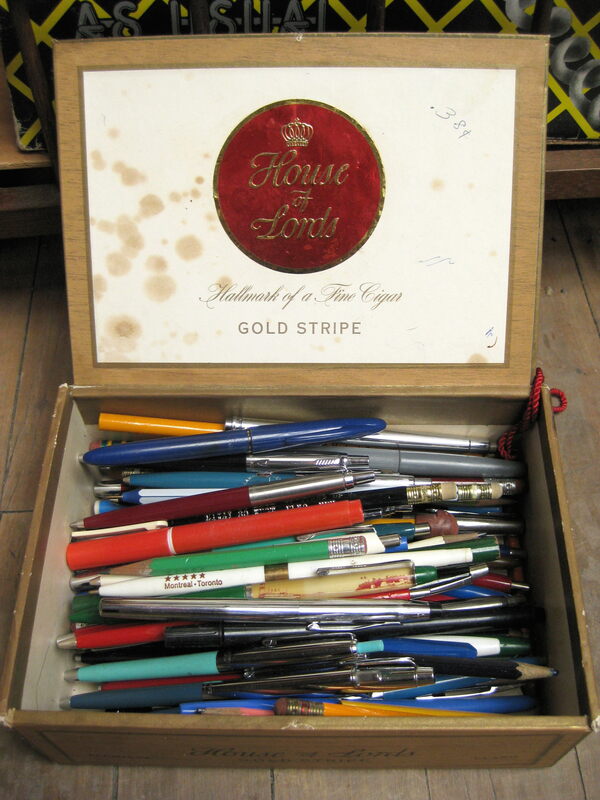 There was a cigar box full of pens and pencils, many of which are of the nice old reusable variety. The brands include Bic, Papermate, Parker and Waterman. 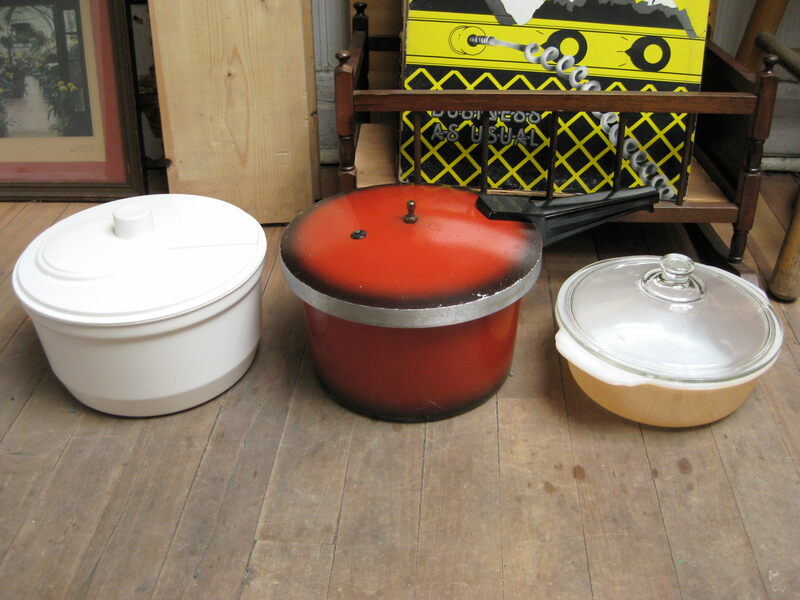 There was some decent kitchen stuff, including the casserole dish on the right – a mildly collectible “Fire King.” The pressure cooker looks good but is missing the top piece and the inner seal. The salad spinner is actually from that earlier place in Glenmount. 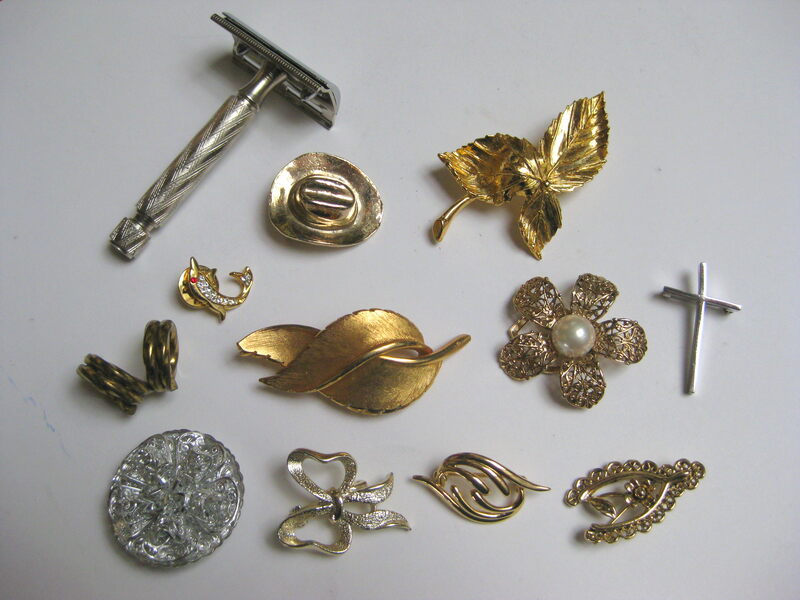 In a plastic ice cream container was a little collection of nice vintage brooches, many of which have definite yard sale value. After we were all done we went to the Give Box and dropped off some stuff we didn’t need. The box was mostly empty before I got there. 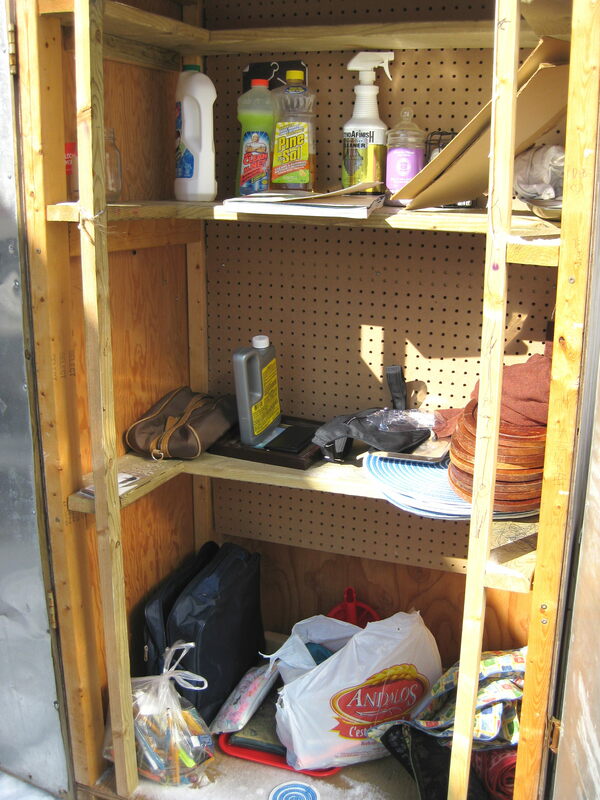 You can see the cleaners from that first place in TMR on the top shelf (with some CLR on the middle). In the middle and bottom are a bunch of kitchen place mats and oval cutting boards that also came from TMR. At the bottom are a couple of bags full of pens, pencils, and art supplies. There’s also a couple of nylon bags in there for good measure. Hopefully this stuff gets put to good use. Next week I plan on doing some exploring in Ville St Laurent. It’s their heavy trash week and I hope to find some decent stuff. I’ll keep you posted! wow, some great stuff. If I lived close a few things I would love to come look closer at, for sure. 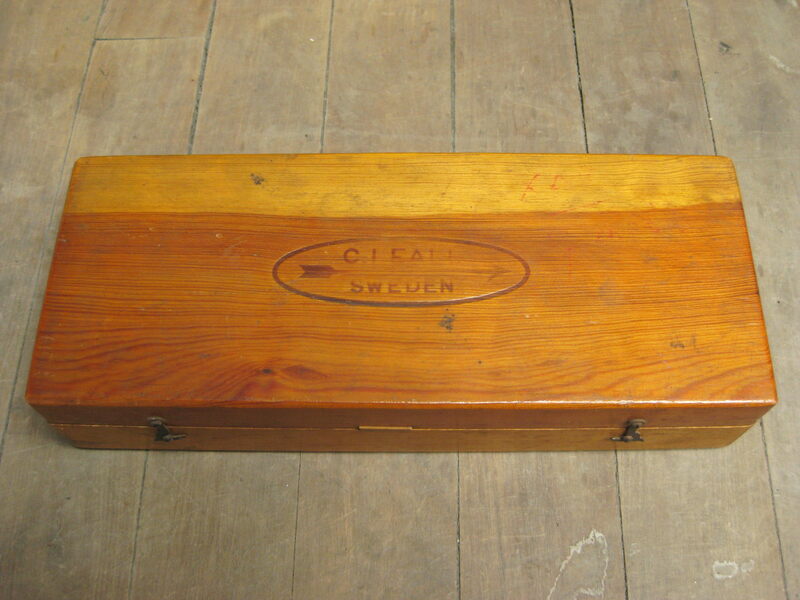 ah well..
that cigar box (with pens), may well be worth a good bit on its own. seem to recall reading they can be quite valuable. Wow, lots of different kinds of stuff and things! Interesting jaw bone. I can’t help wondering wondering what critter owned it. I’m also curious about the holes that have been drilled in the thing. What I find most interesting is that trash bags are just placed on the curb where you live. I live in Arizona and I never see this. We have large roll out garbage cans, that would make for difficult treasure hunting. Good luck on your future hunts, I can’t wait to see what neat things you find. It varies. The island of Montreal is made up of the City of Montreal, and some smaller municipalities. At least some of the smaller ones had different laws, or maybe just standards that have slowly erroded. Everything was in garbage cans when I was young, just putting out the bags is a relatively new thing, though I don’t know if that’s everywhere on the island. Indeed, when i was a kid, the garbage as kept behind the house, the garbage men would come and get it from there. 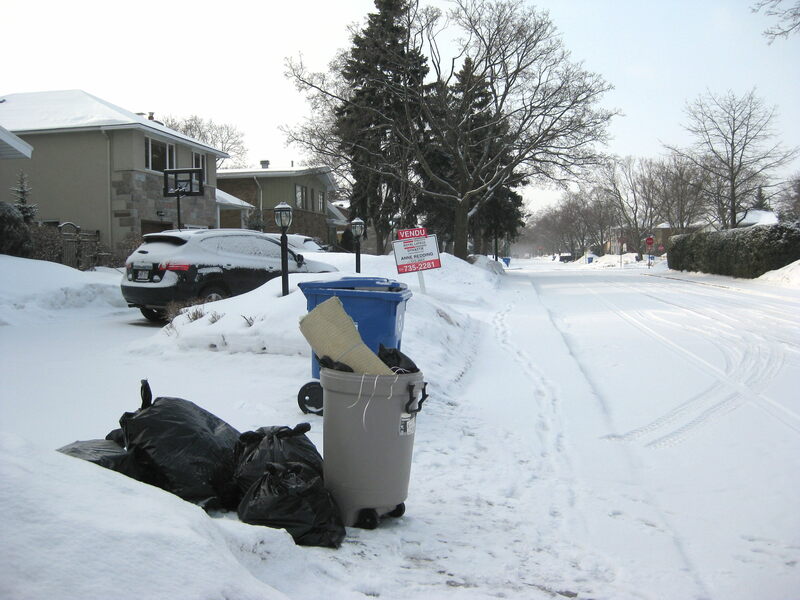 That’s one reason some areas are not as good as others, the garbage may not be readily accessible, certainly not until right before pickup time. 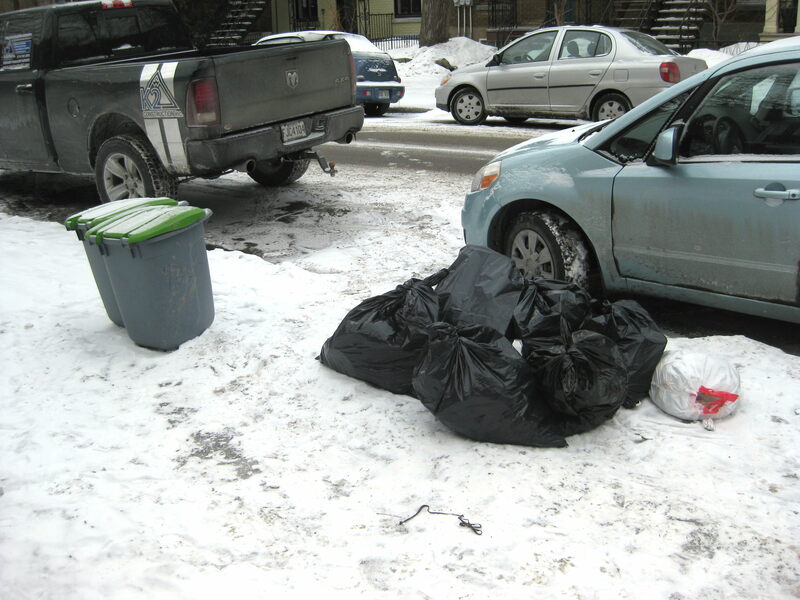 There was a big fuss about 1999 where Montreal passed some new garbage laws. You’re not supposed to use grocery bags for garbage, you had to use big green bags. That generally has happened, indeed my perception of it is that more now gets put into garbage bags rather than just left out, so you have to poke in the bags to find the ‘good stuff”. It was much easier (either that or more good stuff is kept out of the garbage) to find the good stuff before the law changed. Luckily when moving day comes along, there’s less rule following so more of it is visible. 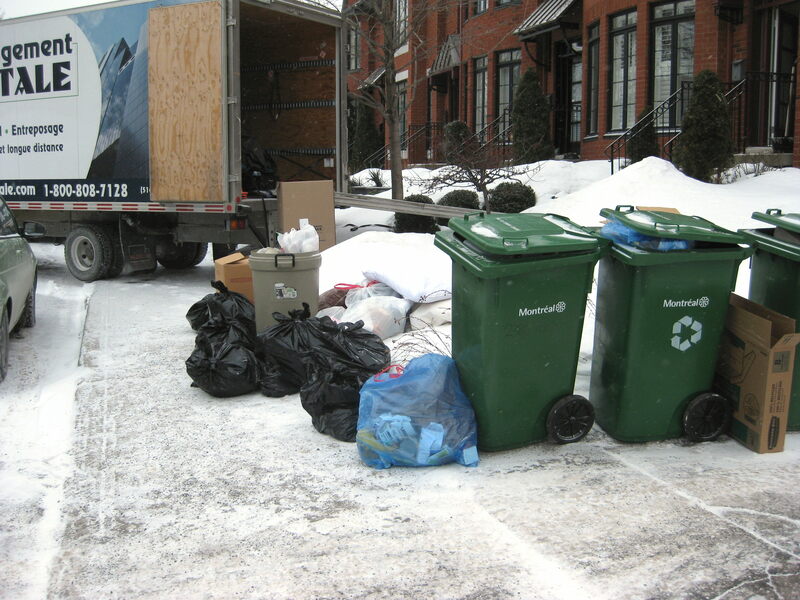 You are making more discoveries and hauling home far more things because of your car.There are still several neighborhoods you never go to.Please visit Montreal North,Ville St.Leonard and Anjou in car and forage on their trash/recycling pickup day.In the west please visit LaSalle,Ville Emard,Cote St.Paul and Lachine.I would like to read your reports on these neighborhoods. You found so much great stuff! The embroidered hankies speak to me! Having the car as an option must be a relief. I love old tools. The drill bits that come in the custom wooden box are cool. 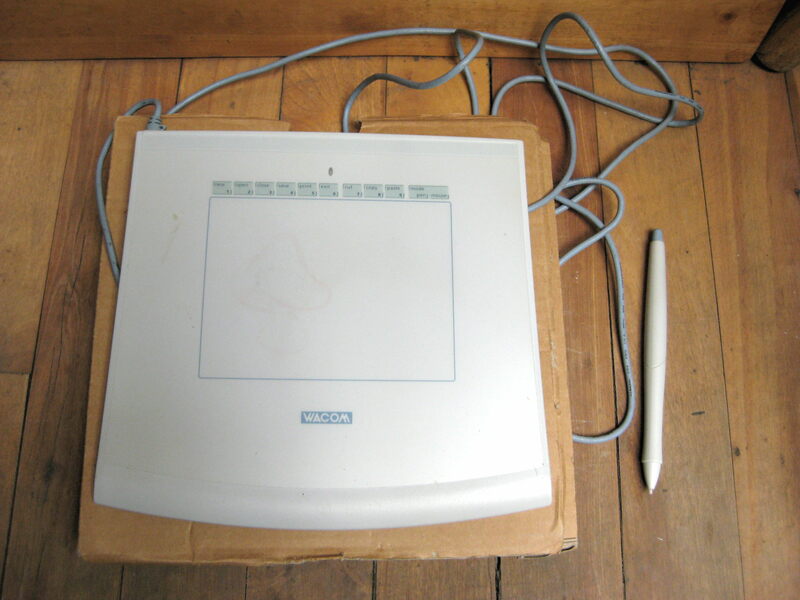 When I found a Wacom tablet tow or three years ago, it was an older one, using a serial interface. Worse, there was no stylus. I think at the time I didn’t realize the stylus was something special, so I just didn’t look for it. It was a decent pile of computer stuff, mostly Macintosh. I suspect I’ll never use the tablet, the cost of the stylus is likely more than it’s worth. That jaw bone looks like it was being crafted into a harp of some kind. There’s an old Finnish instrument called a ‘kantele’ that was originally supposed to have been made from the jaw of a large fish. The designs drawn on the one you found look vaguely Celtic or Scandinavian. Did you keep it?